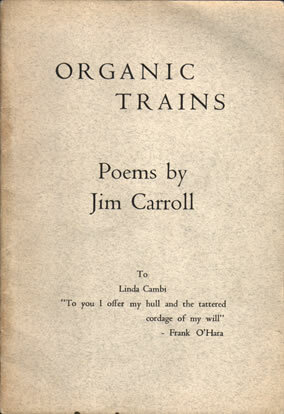 Organic Trains is Carroll's first book, published when he was 16, while he was still in high school (at Trinity). The book is 17 pages long and contains 16 poems. It includes the poems "The Ill Couples," "3 Seas," "Poem," "The Anarchists," "The Crucible of Dreams," "Poem of Arrivals," "On the Way," and 11 trains (eleven poems titled "1st Train" through "11th Train"). Only about 500 copies of this book were printed, and Carroll says the printer lost many of them. It is extremely rare. Carroll wrote the poems while riding NYC subway trains. The poems in Organic Trains were typed and printed by Brent Garren (aka "Bunty Gargen" in The Basketball Diaries) and his girlfriend Janet (mentioned on page 72 in The Basketball Diaries). Cassie Carter, CatholicBoy.com webmaster, shared an office with Janet in 1999-2000 (small world!). If you're still reading, here's the full text.